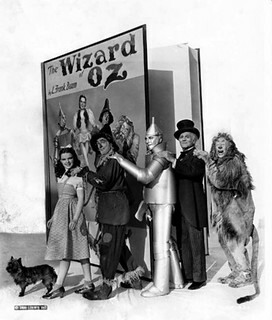 As we noodle on the nanny-cam, we might recall that it was on this date in 1934 that Samuel Goldwyn acquired the film rights to L. Frank Baum’s The Wonderful Wizard of Oz. The novel, published in 1900, had become an instant classic, spawning sequels (that continued under the direction of Baum’s widow after his death in 1919), a long-running Broadway musical, and several silent films. Goldwyn’s version, released in 1939, had modest success at the box office (though it did garner several Oscar nominations–including a Best Song win for “Somewhere Over the Rainbow” and a special award for Garland as Best Juvenile Performer). Then, in 1956, an estimated 45 million people tuned in to watch the movie’s television debut on the Ford Star Jubilee. Countless TV airings later, The Wizard of Oz is one of the best-known– and most beloved– films of all time.